Two centuries of British rule over India have certainly left a deep imprint on Indian psyche. It could be seen even during the national struggle where a so called nationalist leader like Jawaharlal went on to say that he is British by education and it was true. Many so called nationalist leaders with their Oxford backgrounds seemed to shun the very impression that Indian education could have some positives as well . Today the convent educated girls are the most sought after in the Indian matrimonial ads and unfortunately it is seen as the only certificate required for being 'cultured' among many wannabe elites of Indian society. Yet they still want a girl " Grihakarya Daksha " meaning adept at managing house chores. 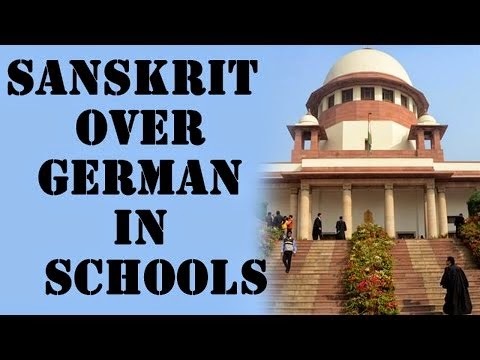 Recent controversy of German vs Sanskrit was marked by many jokes doing the rounds in the Indian net sphere targeting Sanskrit bolster the impression that Indians are yet to understand the antiquity and greatness of Sanskrit. German may have many advantages to offer its students. English language is a part of Germanic language family of European languages and that way it is German which can be said to be the mother of English. The Indian Foreign services officers give priority to German because only then they get priority to work in English speaking countries. Our Foreign secretary is a German speaker. First modern Europeans to show interest in India were German like Max Mueller and it was his study that made the ground work for the Aryan theory. Though Nazi Germany's claims to Aryan roots were complete bogus. Probably they just stole this word from Sanskrit which means someone from noble family and has been used in India for thousands of years unlike Nazi Germany where it made a sudden appearance. Keeping history aside ,Germany is one of the most sought after countries for pursuing higher education courses and engineering in particular. Knowledge of German may be very useful for those Students. But I was left aghast at the stupidity of some Delhi Radio jockeys using Sanskrit for jokes not realizing that it is Sanskrit which binds us together. A language much older than Greek and Latin. To this day many East Asian languages like Burmese, Cambodian, Thai, Malay and Indonesian Bahasa show unmistakable imprint of Sanskrit . A languages that predates early christian and Judaism era by a thousand years. It is a classical language , a language whose influence continues to extend beyond the time when it is no longer spoken colloquially. Sanskrit and Geeta should not be used for political mileage. The previous government may have had its reason to teach German as the third language in Indian schools but it is our responsibility to make students familiar our future generations with our past. The antiquity of India's civilization and richness of its culture has many admirers. History should not be tweaked for political reasons but history should not be untold as well for the reason that no country can survive being cutoff from its identity and past . The ministry's decision to teach Sanskrit is correct.